Due to her great success as the QUEEN OF THE NIGHT at the Warsaw National Opera House in 2016, Alekrandra Olczyk was engaged in 2017 to sing this role at the Comic opera Berlin in a Barrie Kosky production. Ever since, she is a regular guest at this renowned opera house. In 207 she also made her debut in this very role at the German Opera Berlin , she returned to the Warsaw National Opera and sang a series of performances at the Finnish National Opera Helsinki. In the season 2017/18 she also enjoyed great success as GILDA at the Warshaw National Opera. 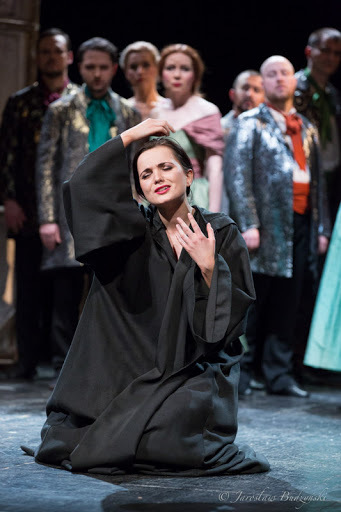 Alseksandra Olcyk sang her first QUEEN OF THE NIGHT in 2016 at Joburg Theatre Johannesburg in South Africa, and at the Opera Nova in Bydgoszcz. As DONNA FIORILLA in Rossini's »Il turco in italia« in a Chriopher Alden production she enjoyed great successes at the Warsaw Chamber Opera and even here she charmed as BLONDE in »Die Entführung aus dem Serail«. She was the only soprano who participated in the 55th International Music Festival in cooperation with the National Philharmonic Orchestra Tokyo. Within the context of a concert trip to Stockholm, Vienna and Salzburg, she could be seen with excerpts from the parts of MUSETTA and FRASQUITA. The young, talented soprano studied singing at the Feliks Nowowiejski-Music Academy in Bydgoszcz, in the class of Magdalena Krzyńska. Already in her early youth, she performed on several stages In Poland and abroad e.g. twice in Italy, when she gave concerts both for Pope John Paul II. and Benedict XVI. As a teenager she won several Polish singing competitions such as the Grand Prix of the Halina Halska-Fijałkowska International Vocal Competition in Wrocław, the 1st Prize at the Jan Kiepura International Vocal Competition in Krynica-Zdrój, the 1st Prizeand the Spec ial Prize for Extraordinary Stage Performances at the 9th Złote Głosy International Singing Competition in Warsaw, the First Prize at the 3rd Festival of Italian Opera Music "Belcanto per semper" in Włocławek, an Award at the 4th International Singing Competition J., J. and E. Reszka in Częstochowa and the 3rd Prize and a number of special Prizes at the 5th National Polish Operetta and Musical Competition Iwona Borowicka in Krakaw. Aleksandra Olczyk absolved master classes with Helena Łazarska, Stefania Toczyska, Izabella Kłosińska, Olga Pasiecznik, Piotr Bednarski, Brenda Hurley, Matthias Rexroth, Paola Larini and Peter McClintock . She performed in concerts with the Pommern Philharmonic Orchestra in Bydgoszcz, the Rzeszow Philharmonic Orchestra, the Krakaw Philharmonic Orchestra, the Polish Sinfonia Baltica Philhamonics in Słupsk and the Częstochowa Philharmonic Orchestra. »[...] impressed with her crystal-clear soprano voice - charakterized by lightness and intensity – wich, combined with solocello and organ formed a perfect homogeneous unit.« The German newspaper Kieler Nachrichten wrote on her German debut with Robert Schumann's Mass in C Minor with the Philharmonic Orchestra Kiel in 2016. In 2018/2019 she returns to the Warsaw National Opera and the Berlin Comic Opera . She also sings the QUEEN in New York, Australia, New Zealand , az zhe Karlsruhe State Theatre and at the Opéra de Lille. In 2019/20 she sings the QUEEN at the Wiesbaden State Theatre and makes her debut here as SOPHIE in »Der Rosenkavalier«..
With the Warsaw Philharmonic Orchestra, she sings Beethoven's CHRIST ON THE MOUNT OF OLIVES and at the Hof Theatre she sings her first LUCIA DI LAMMERMOOR. In 2020/21 she sings the QUEEN at the Glyndebourne Festival. Aleksandra Olczyk shone as the Queen of the Night, her voice absolutely soaring in the breathtaking aria. The Queen of the Night is represented as a giant spider alien from one of those movies with the power to control. Aleksandra Olczyk makes her difficult arias sound easy. So The Queen of the Night (Aleksandra Olczyk) is transformed into a huge spider, her coloratura slicing through the auditorium so sharply you could cut diamonds with it, as her eight legs toy with her daughter Pamina (Kim-Lillian Strebel), or throw daggers at her enemies. Aleksandra Olczyk as the gigantic, spider-like Queen of the Night has the show-stopping number: the coloratura tour-de-force that is the measure of operatic sopranos. Her beautifully clear, stunningly controlled performance was a highlight. 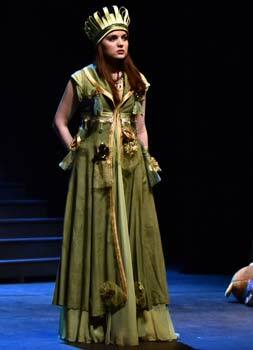 …but perhaps the most complete performance came from Aleksandra Olczyk as the Queen of the Night. The Polish soprano had plenty of tone and secure coloratura - she seemed to sail through linguistically, too – and in Esther Biala’s designs the portrayal of the Queen of the Night as a giant, stage-filling spider is one of the production’s most brilliant images.